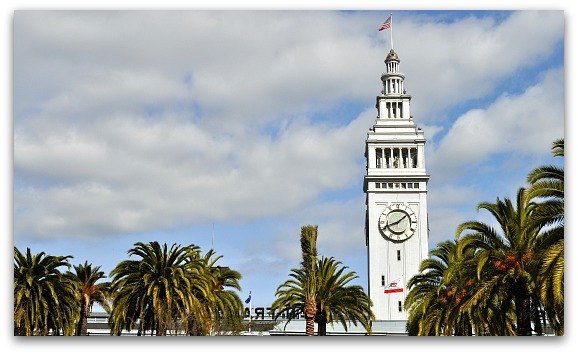 The Ferry Building San Francisco is a gourmet food and wine lovers dream. This historic building offers almost a dozen shops with a variety of local cheeses, fresh baked bread and delicious chocolates. One of my favorites here is an amazing wine shop with a cute bar area. You can either sample before you buy or just sit back and relax as you enjoy a great glass of wine. I'm also a huge fan of Gott's. This modern burger joint offers one of the the tastiest gourmet burgers in town. It's one of several great restaurants in this building. The rest of this market place includes additional gourmet shops and several places to buy kitchen gadgets. You can also just walk through to the other side to grab a ferry to one of several places around the bay area. Where is the Ferry Building in San Francisco? It's under the large clock tower on the eastern end of Market Street. It originally opened in 1898. Although it recently underwent a renovation inside, the building you see is the original building that opened in 1898. It's a special historical monument in San Francisco as it survived both the 1906 and 1989 earthquakes. For decades, hundreds of people came through here on their way in and out of the city. At the time, this was the only way to quickly get into San Francisco from both the north and east bay areas. 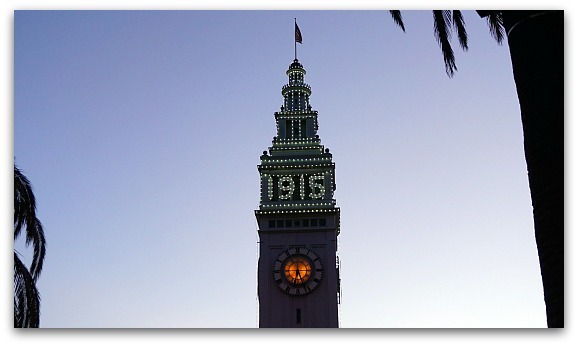 In 2015, the Ferry Building was lit up with lights saying 1915. This was for the 100th Anniversary Celebration of the 1915 Panama Pacific Expo. During that event more than 100 years ago, the Ferry Building was all lit up in white lighting also. As more people bought cars and bridges opened, fewer people used the ferries and the terminal eventually closed. For years, the building wasn't used. In addition, a huge, ugly double decker freeway was built right in front of it. The city removed the freeway in 1991 due to damage that was beyond repair from the 1989 earthquake. This is when developers decided to breath new life into this historic landmark. The Ferry Building San Francisco dedicates its space to amazing food. You will find a long list of restaurants as well as shops selling everything from some of the best cheese around (Cowgirl Creamery) to local honey. It's a great place to stock up your kitchen with gourmet goodies and high-end gadgets. 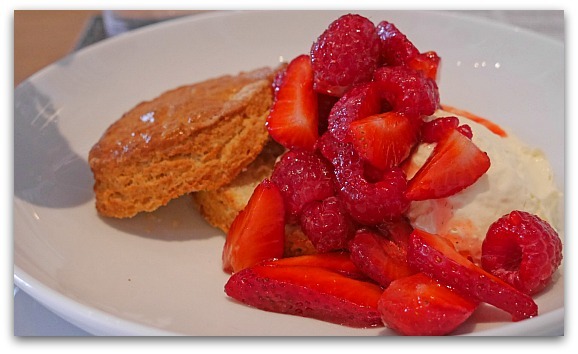 If you want to sit down for a bit to eat, you will find about a half dozen top restaurants. Some of my picks include Boulette's Larder (Mediterranean), Gott's Roadside (burgers and fries), Hog Island Oyster Company (fresh oysters and clam chowder), and The Slanted Door (Vietnamese). You can eat here for breakfast, brunch, lunch, or dinner. The Ferry Building San Francisco is all about gourmet food and drinks. With dozens of shops -- where should you start? Let an expert show you around! This SF Food Tour is a two hour tasting tour that is perfect for foodies. You will sample a variety of fresh meats, cheeses from around the world, chocolate delights and other amazing treats that are available here. Not only will you find an array of fresh food, but you will also find some great wines. The best place to stop for a tasting is the Ferry Building Wine Merchant. This cute wine bar has a large selection of wine tasting options available from around the world. You can even enjoy bread, cheese and other items from different merchants as you sample wine. The Ferry Building San Francisco is also still a working ferry terminal. Hundreds of people take the ferries to and from San Francisco each day. Here you can pick up a ferry to Sausalito or Tiburon. You can also pick up a ferry to other places in the bay area such as Alameda, Larkspur and Vallejo. This walking tour is all about the history of this building. On this one-hour tour, you will learn more about the rise, fall, and rebirth of this famous SF building. You will also learn more about the ferry system, what happened to this building during our major earthquakes, and more. This walk typically runs every Tuesday at noon and Saturday at 10am. It's free, but they do ask for donations. Three days a week, the outside of this building bursts with activity from the Farmer's Market. Here you can pick up additional gourmet foods, beautiful flowers and other unique gifts for friends and family. The Farmer's Market is open from 10 am to 2 pm on both Tuesday and Thursday. On Saturday, the Farmer's Market is open from 8 am to 2 pm. Both inside the Ferry Building San Francisco and at the Farmer's Market, you will find hundreds of fresh and delicious treats. Do you need some ideas to pull them all together for a meal? Before your visit, check out this special Farmers Market Cookbook. It has hundreds of recipes. The book is set up by season, so you can easily find the right ingredients in the market based on the time of year you visit. The book also includes some excellent tips on selecting and using seasonal fruits, vegetables and other items from the Ferry Plaza Farmer's Market. This is a must have for those that love to experiment and want to take advantage of all of the amazing food available. The Ferry Building San Francisco is open from 7am to 10pm. However, each shop in the Ferry Building drives its own schedule. Most follow the minimum hours set by the management, although many restaurants and the Wine Merchant stay open later. All shops and restaurants close Christmas and have limited hours during other winter holidays. 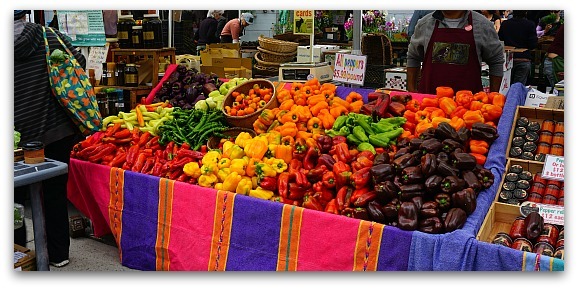 The farmer's market is on Tuesday from 10am to 2pm, Thursday from 10am to 2pm and Saturday from 8am to 2pm. It runs all year long with a few changes to their schedule on holidays. From Union Square: The Ferry Building San Francisco is an easy walk or bus ride from Union Square. It is at the end of Market Street on the eastern side of San Francisco. You can't miss it. If you walk, it will take about 10 minutes. You can also grab one of the dozens of buses or street cars along Market Street. Most drop off within a block of it. From Fishermans Wharf: It's also a quick trip from Fishermans Wharf. Your best option is to take the F Street Car from the Jones and Beach Street stop in Fishermans Wharf. 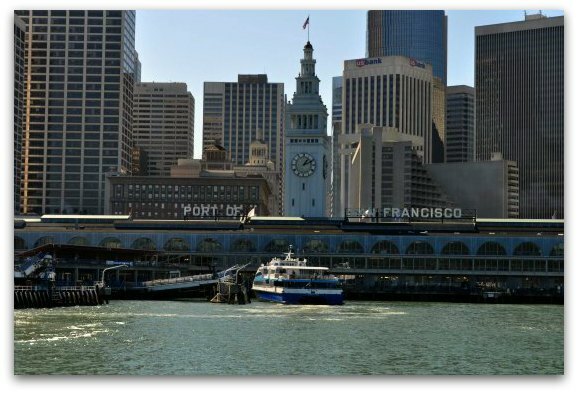 It will take you about 10 minutes to reach the Ferry Building. The stop you want is right across the street.